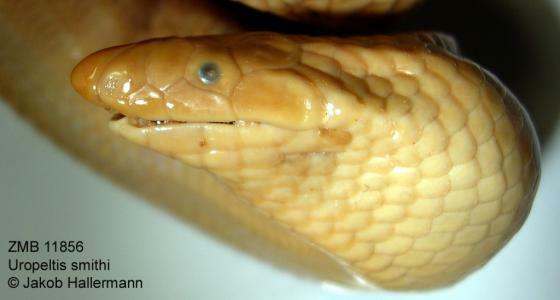 Can you confirm these amateur observations of Uropeltis grandis? Distribution India (Anaimalai hills, 4,000—4,700 feet, Kerala). Types Syntypes: BMNH 1946.1.16.52; MNHN = MHNP 95.79. Comment Synonymy: R. grandis BEDDOME 1867 is a secondary junior homonym of Uropeltis grandis KELAART 1857 and has therefore been replaced by GANS 1966. The name U. smithi Gans, 1966 was created as a replacement for Rhinophis grandis Beddome, 1867. 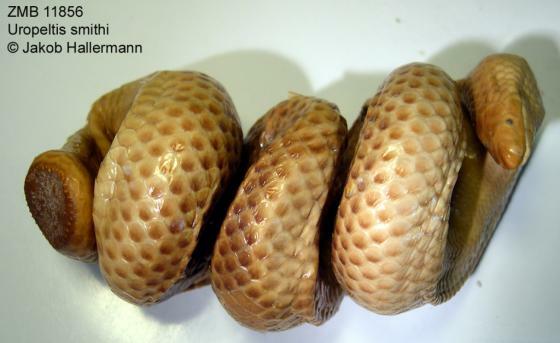 A possible issue of homonymy was created when Rhinophis grandis Beddome, 1867 was transferred to Uropeltis by Smith (1943), since U. grandis Kelaart, 1853 was a pre-existing name. Gans (1966) thus erected U. smithi as a nomen novum for Rhinophis grandis Beddome, 1867, with the same type series and locality. However, Tennent (1861) had long since relegated U. grandis Kelaart, 1853 to the synonymy of Pseudotyphlops philippinus (Müller, 1832), which Pyron et al. 2016 renamed as R. saffragamus (Kelaart, 1853) n. comb. Etymology Named after Hobart M. Smith (1912-2013), American herpetologist and one of the most prolific herpetologists of all time.